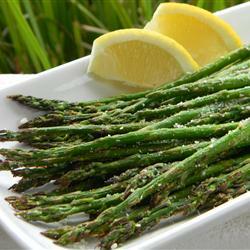 Place asparagus in a single layer onto the prepared baking sheet. Drizzle with olive oil, salt and pepper, to taste; gently toss to combine. Place into oven and roast for 8-10 minutes, or until tender but crisp. Serve immediately, tossed with garlic, lemon juice and Parmesan.